Tired of your cramped apartment, its moldering walls, battered furniture, and the fact that it isn’t on a pirate island or in outer space? Well, researchers have now managed to use Google’s Tango platform to create a simple app that allows you to scan your home and then walk through it in VR. The interior of a normal building is transformed into a world complete with frolicking deer, for example, as the video below shows. They say this is a new step for Google’s room-scanning Tango system, which so far has been used to create an augmented reality overlay on a phone screen, but not a full VR experience like this. Misha Sra, a PhD candidate at MIT’s Media Lab and one of the developers of the project, says she wants to “democratize” VR, so that anyone can pick up a phone and create a virtual environment. 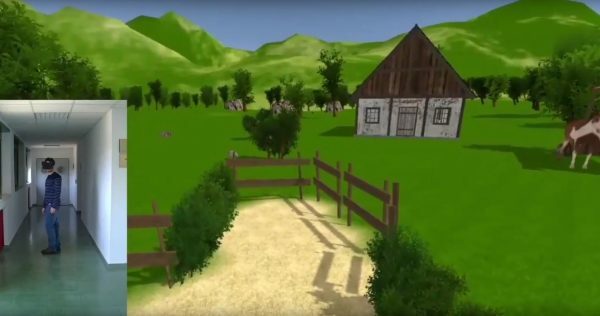 “Let’s say you want to ask your Grandma to build VR for her living room, or house. All she would need to do is pick up a Google Tango-powered phone tablet, turn on the app and walk around her house,” she explains. Your VR house is then viewable on the very same phone through a headset. So far, the software can turn an interior into four different environments: a lush wood; a rocky island surrounded by shipwreck debris; a volcanic lava flow; and a platform floating in space. The system works by detecting walls and replacing them with barriers in VR so you don’t walk in to them, depending on the environment being mimicked – so a fence in the wood, or lava in the volcano. You might also worry about tripping over your coffee table, but Sra says the software has that covered. Although the rooms shown in the demo video are clear of stumbling blocks, Sra explains that furniture can be visualized as things like rocks or ponds so users steer clear. The system, called Oasis – named after the virtual world in the book Ready Player One, which Sra was reading while working on the project – also automatically detects chairs and represents them virtually so you can sit down as you luxuriate in your virtual home. Objects in your house are tracked in real time, so that if you move the chair it will follow you in VR. It’s the same idea as was on display at the recent CES conference from Intel’s Project Alloy, a headset that claims to be able to scan your room and replicate it in VR – meaning you can duck behind your real furniture while gaming. Oasis could be used to make your home more appealing, Sra thinks. “Let’s say it’s the middle of winter in Boston,” she says, and going outside is not the most appealing idea. “You say OK, I want to be at the beach – and so you’re at the beach.” Friends in VR are then able to come and hang out and tell stories in your spruced-up living room. Sadly, Sra’s project is an early stage research demo, and not close to being a finished, available product. But next, she and her fellow researchers want to give users the ability to customize their VR house, selecting an environment to their taste.